At a roulette table, betting options include the simple coin-flip choice of red or black. 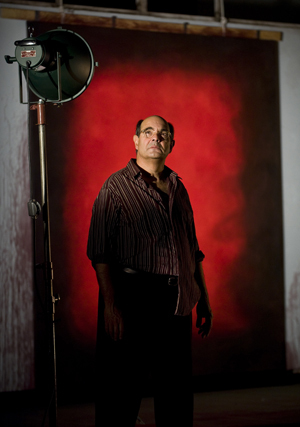 In John Logan’s play “Red,” that’s how the painter Mark Rothko sees human life in its ultimate reduction on the wheel of fortune: Red as positive energy, black as nothingness – death. Red is what drives us, defines us; black is the terminus whose coming we dread and whose arrival date we cannot know. Thus affirmation and fear become life’s push and pull, potential and constraint, the all-powerful ying and yang. To wage this titanic battle of opposites, Logan needs only two characters, the great abstract expressionist Rothko (1903-1970) and a fictious young assistant called Ken. These two alone, in the persons of Edward Gero and Patrick Andrews, fully populate the space of “Red” in an electrifying production that opened Wednesday at the Goodman Theatre. Logan, a veteran screen-writer whose film credits extend from Star Trek to James Bond, found inspiration for “Red” (2009) in a famous incident that reflected opposing forces in Rothko: a fiercely independent spirit and a torment rooted in his impoverished beginnings. Rothko’s name was Marcus Rothkowitz when his parents, Orthodox Jews from Russia, immigrated to Oregon lest their sons be conscripted into the czar’s army. The incident that intrigued Logan involved a commission Rothko received to create a series of murals to be installed in a posh restaurant called The Four Seasons planned for the majestic new Seagram skyscraper on Park Avenue in New York. The architects were none less than Mies Van der Rohe and Philip Johnson. Even though Rothko was well established by then (1958), this was a plum assignment, a gold-plated certification of his ascendancy into the first circle of American painters. And he would be paid $36,000, a handsome fee. Though Rothko hated the term abstract expressionism, critics glued it to his mature style, which consists essentially in elongated color masses juxtaposed as verticals and horizontals. These layered, raggedly bordered color areas typically contrast two dark hues that seem to set each other in motion. You can’t just walk by a Rothko painting and actually experience it. Only by pausing and gazing into it can you engage its dynamic energy, its life-pulse – or, as Rothko insisted, its tragedy. Sitting in his studio, gazing at a work-in-progress, is where and how we find Rothko when the curtain rises on “Red.” He’s interrupted by Ken, a young artist who hopes to work as assistant to the celebrated painter. Ken, read in lower-case, might symbolize knowledge, understanding, perception. This particular Ken also represents the next wave, the new that ever challenges the old, though it seem slight and tentative on first appearance. Now the stage – designer Todd Rosenthal’s cathedral-like studio – is set for the tumultuous, evolving artistic and psychological dialectic that is “Red.” It begins quietly, as the great man poses a question to this unprepossessing lad looking at one of the murals intended for the Four Seasons: “What do you see?” What follows has the ring of a Platonic dialogue, as Rothko presses the young man to look again, truly look, and think harder. Indeed, the Rothko that Edward Gero embodies is very much a philosopher-king, absolute in his judgment, confident of his own superiority, disdainful of the rabble who pass for critics and appalled that his wonderful, living, breathing paintings, his children, should be purchased as mere objects by wealthy philistines seeking to color-coordinate an expensive piece of art with their drapes. Gero inhabits Rothko, becomes the conflicted, agonizing artist who envies Jackson Pollack his success even as he generally despises the world beyond his studio walls, especially the wealth into which he was not born. In one of many insightful choices, director Robert Falls frames Gero’s obstreperous Rothko in sublime music the painter plays on a phonograph – Bach, Mozart — to accompany his contemplations. Just as Gero is an overwhelming presence from the start, Patrick Andrews’s Ken emerges by subtle, sure degrees from acolyte to something approaching colleague. In that progression, the two men form an artistic and spiritual bond. If the play has a signature moment, it’s the explosive ballet of master and youth priming a vast canvas with red paint, here an act of procreative violence that leaves them both exhausted and even astonished by their flashing deed. Yet Ken is neither Rothko’s true companion nor his alter-ego. He is every artist who ever came along to admire, learn from and collide with the artistic ego du jour. In a fiery monologue that turns the play on its head, Andrews surely leaves us all wondering about the certitude of our aesthetic convictions. Ken’s idea of contemplative music is John Coltrane’s hard bop. Does Coltrane trump Mozart? Must Rothko give place to Warhol? Or are they all ultimately – like roses, cherries, blood and sunset – expressions of red?